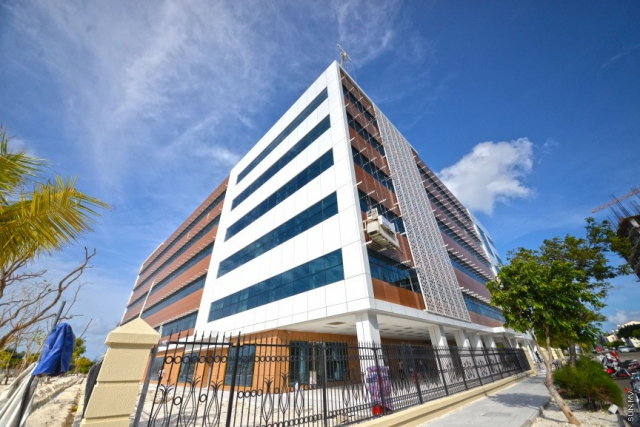 The USD 110 million multi-specialty hospital in Hulhumale’, Tree Top Hospital is scheduled to open on Thursday, March 1. The announcement was made at a press conference held by Tree Top this Tuesday morning. The Chairman of the Board of Directors of Tree Top Investments – which developed the Tree Top Hospital – is Lars Peter. Managing Director is Ahmed Nazeer (Crown Nazeer). Other members of the Board include (Champa) Hussain Afeef, (Champa) Mohamed Moosa, (Gadhagey) Ahmed Saleem, his son Adam Saleem, Abdul Ghanee, Ibrahim Nooruddin, and Dr. Ibrahim Wishan. At Tuesday’s press conference, Tree Top said the hospital will only provide Aasandha health insurance during the initial days only for patients who are admitted, but will expand Aasandha services to other patients soon. Noting that Maldivians spend millions each year for health services abroad, management of Tree Top Hospital said the biggest advantage to Maldivians once the hospital opens is that Maldivians need not travel abroad for health services, but can receive health services with their families nearby. Patients will receive services of doctors and nurses from 35 countries from the Tree Top Hospital. Businessman and shareholder of Tree Top Investment, Champa Hussain Afeef said his biggest dream is that the hospital one day employees Maldivians as all its staff. “The biggest dream is that, one day, the entire hospital only has Maldivian doctors and nurses,” said Afeef. Afeef said that a long-term dream though it may be, Tree Top will work towards achieving the goal. Architect and shareholder of Tree Top, Saleem said the hospital was the hardest project he has ever undertaken. He said the equipment used in the hospital were completely new to Maldives. Saleem said construction of the hospital building was contracted to a Turkish company because no local company had experience in constructing such a modern hospital. The Tree Top Hospital said it will provide all its services by June. Specialized services provided by the hospital includes cardiac services and gynecology. The hospital, with its modern equipment and services will have 210 beds. The hospital will be managed by Australia’s Ramsay Group and Malaysia’s Sime Darby. Tree Top Hospital will also have special hourly ferries to transport patients from Male’ City to Hulhumale’. The motto of the hospital is “Patient First”. The hospital promises patients will be able to see doctors at the given appointment time. It also said online appointment services will be made available soon. The hospital currently requires appointments be made via phone. Medical Services In-charge of Tree Top Hospital said the hospital will revolutionize the Maldivian health industry and take it to the next level. He said the hospital will provide international-standard services with its 80 doctors who received their education from top universities across the world. He also said the Tree Top Hospital will take medical tourism in Maldives to the next level. Tree Top Investments already runs a clinic in Male’ City which provides services of a specialist doctor each week.